These enteric coated oregano oil capsules from Now Foods are a specific for reducing candida overgrowth and other types of intestinal dysbiosis (bad micro-organisms). In recent years, the powerful benefits of oregano oil have become common knowledge. Among its other qualities, oregano oil has proven effective in helping to kill a wide range of fungi, yeast, and bacteria as well as parasites and viruses. However, taking standard oregano oil capsules will not be that helpful for combatting candida and other harmful organisms in the gut, as they dissolve in the stomach. Only the enteric coated capsules will pass through the stomach into the intestinal tract where they will do their work of reducing or destroying the colonies of yeast, fungus, parasites, and/or bad bacteria which are wreaking havoc in your body. 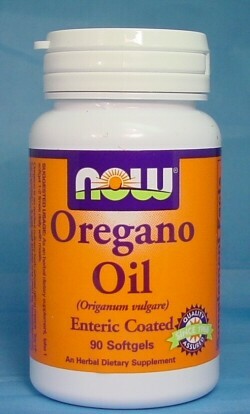 Oregano Oil (min. 55% Carvacrol) 181 mg.